Can Mimi undo the mayhem caused by her baking in this contemporary-fantasy retelling of Shakespeare's A Midsummer Night's Dream? Eleven-year-old Mimi Mackson comes from a big Indian American family: Dad's a renowned food writer, Mom's a successful businesswoman, and her three older siblings all have their own respective accomplishments. It's easy to feel invisible in such an impressive family, but Mimi's dream of proving she's not the least-talented member of her family seems possible when she discovers a contest at the new bakery in town. Plus, it'll start her on the path to becoming a celebrity chef like her culinary idol, Puffy Fay. But when Mimi's dad returns from a business trip, he's mysteriously lost his highly honed sense of taste. Without his help, Mimi will never be able to bake something impressive enough to propel her to gastronomic fame. Drawn into the woods behind her house by a strangely familiar song, Mimi meets Vik, a boy who brings her to parts of the forest she's never seen. Who knew there were banyan trees and wild boars in Massachusetts? Together they discover exotic ingredients and bake them into delectable and enchanting treats. But as her dad acts stranger every day, and her siblings' romantic entanglements cause trouble in their town, Mimi begins to wonder whether the ingredients she and Vik found are somehow the cause of it all. She needs to use her skills, deductive and epicurean, to uncover what's happened. In the process, she learns that in life, as in baking, not everything is sweet. . . . Midsummer's Mayhem is an enchantment of a novel, bursting with magic, mystery, and mouth-watering baked goods. Readers who have their own baking-show dreams will be cheering for Mimi until the very last page. Midsummer's Mayhem is a delightful confection of a family story full of heart, magic, and a baking championship with mysteriously high stakes! LaRocca takes an almost-throwaway reference in Shakespeare's A Midsummer Night's Dream and reclaims it by having a multiracial Indian-American family at the center of her tale. Mimi's pluck, gentle courage, and knack for combining flavors will capture readers' hearts, imaginations, and undoubtedly, taste buds! 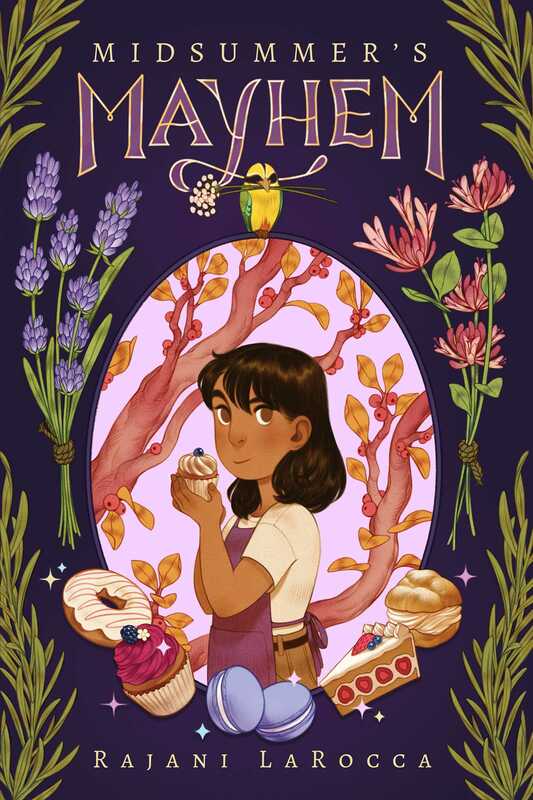 Taking its inspiration from one of Shakespeare's most popular comedies, Midsummer's Mayhem is a sweet and fun story about mistaken identity, bumpy romance, and the everyday magic of baking. Laugh-out-loud funny one moment and mouthwateringly delicious the next, Midsummer's Mayhem is an utter pleasure to consume from the very first page! LaRocca's debut novel entices and bewitches-I dare you not to fall under its spell. Absolutely scrumptious! I fell in love with this book and devoured it in one day. LaRocca crafts a spell of tricky fairies, lovable mortals, and heartfelt magic. Mimi is determined, resourceful, and unfailingly kind. Perfect for aspiring bakers, younger siblings, or anyone with a passion. Rajani LaRocca has concocted a delectable story about family, friendship, baking, and magic that readers are sure to devour! Relatable, lovable Mimi is easy to root for, and LaRocca brings the whole cast of characters to life with her deft descriptions and realistic dialogue. Readers will delight in Midsummer's Mayhem! – Erin Dionne, author of Lights, Camera, Disaster! An absolute delight-LaRocca's delectable debut is whimsical, frothy, and so much fun. An inventive take on a classic comedy, Midsummer's Mayhem is a sweetly-told tale of family, friendship, and following your passion. This is a book for the dreamers and doers alike; effervescent, full of heart, and ultimately joyful.